Mountain View Service Manager Dan Lasham relates the history of the Park. 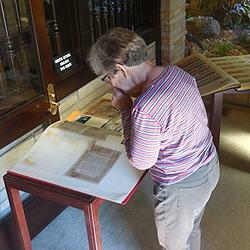 Scrapbooks with articles and memorabilia from the Park's past century were on display in the foyer. 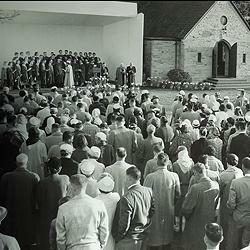 Among the items in the scrapbooks: A photo of an Easter service held outside the Garden Chapel, sometime in the 1950s. The following, adapted from Nancy Covert's article in our Winter 2015 "Prairie Gazette" newsletter, is illustrated with photos from our September 2015 monthly program on the history of Mountain View, held in the Memorial Chapel. There are five major cemeteries in the Lakewood area: Old Settler’s Cemetery, on Washington Blvd; the Masonic Cemetery, off Masonic Road; the Home of Peace Jewish Cemetery, off Steilacoom Blvd; the Western State Hospital patient cemetery in Fort Steilacoom Park and Mountain View Memorial Park. December, 2015: Mountain View Memorial Park commemorates 100 years of serving the community. Founded in 1915 by James. R. Thompson, Al Gamer and Mr. Williamson, original investors at Mountain View first wanted to keep their options open for the site’s use. The land they selected could have become a quarry, a mine, a railroad line—or any other commercial venture. Instead it became a cemetery. The first burial on the original 80-acre site was of a 54-year-old man, followed by that of a two-year-old infant. In the following year of 1916, 52 burials were made. In 1942, Mountain View became the first cemetery in the Northwest and the second in the nation to open a funeral home inside the park’s boundaries. 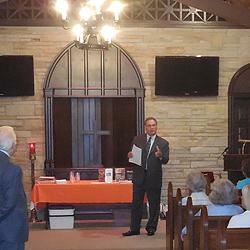 During the decades the Memorial Park’s services have expanded to meet clients’ needs. Today the site occupies 160 acres, of which 110 acres are dedicated to cemetery use. According to the Park’s website, 1,000 people per year are buried there, while 1,400 funeral services are held annually. More than 100,000 individuals are buried at the Memorial Park along Steilacoom Boulevard, across from Clover Park Technical College. Although older cemeteries contain prominent upright monuments, early in Mountain View’s existence a decision was made to place monument markers flush with the ground, creating a park-like appearance. In keeping with this theme, Mountain View contains 181 varieties of trees, 575 rhododendrons, and has a prize-winning rose garden, in addition to assorted wildlife. Its landmark “Garden Chapel,” built in 1933, was patterned after Grace Church in London, England. Although the original chapel was destroyed by fire in 1992, it was rebuilt and enlarged. The "Valley Chapel" was built in 1962. Both chapels are dedicated religious buildings, and while used primarily for funerals, weddings are also held there. Mountain View has particularly closes ties to the military. There is a special section dedicated to the internment of veterans. A recent burial was for Air Force Captain Douglas Ferguson, MIA since 1969, whose remains were discovered in 2013 in Laos, returned and buried in May, 2014. In 1934 Mountain View provided full military honors for a German sailor who died of food poisoning while aboard his ship docked in Tacoma. In November 2009 they provided all of the funeral arrangements for honoring the four fallen Lakewood Police officers. Each year Mountain View Memorial Park hosts a Memorial Day Service, a Veteran’s/Remembrance Day Service, as well as Easter Sunrise Services. In past years a larger-than-life sized Nativity set was displayed. (The Lakewood Log published an ad from the Park featuring this holiday display). In November, 2014 it commemorated not only Remembrance Day, but also the State’s 125th anniversary.